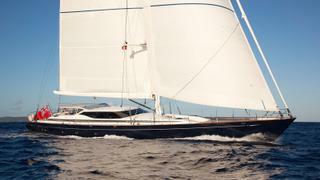 The 37 metre sailing yacht Nashira II has been listed for sale by Alastair Shove at Carrswood Yachts. Built in aluminium by British yard Camper & Nicholsons to a design by Dubois, Nashira II was delivered in 1999 and received a major refit in 2016/17. An interior by Redman Whiteley welcomes eight guests in four cabins configured as a master suite, VIP suite and two twins, all with en suite shower facilities. A further three cabins sleep six crewmembers aboard this yacht for sale. The raised deck saloon is a light and spacious area offering excellent panoramic views thanks to large windows and there are long sofas on the port and starboard sides. A large dinette table is to starboard along with an internal forward-facing master navigation area. There is also a bar with a small sink, large integral drinks fridge and an ice maker. In the lower saloon is a very spacious relaxation area with two sofas to port, coffee tables and bookshelves along with a large flatscreen flush mounted television set. A large dining table to starboard seats eight guests comfortably. Under power, a 332hp Caterpillar diesel engine delivers a cruising speed of 11.5 knots topping out at 13 knots and she has a range of 2,800 nautical miles at 11.5 knots. Lying in Gosport, UK, Nashira II is asking €3,250,000.